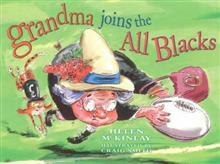 When Grandma finds out the All Blacks are sick and tired of training, she combines her famous zest for life with a hearty helping of her special marmalade, and soon has the team back on track for the big test match. The sequel to our very successful picture flat Grandma's Week Off, this time our favourite unconventional Grandma proves to be the savior of the All Blacks, our national rugby team. When Grandma finds out the boys are sick and tired of training, she combines her famous zest for life with a hearty helping of her special marmalade and soon has the team back on track for the big test match. They visit the circus, go kayaking and generally have a whale of a time - after all, all work and no play makes anyone dull and dreary, and no one knows that better than our irrepressible Gran. Each day she comes up with a new plan to inject some fun into their training sessions - and by the end of the week they're match fit and rearing to go. But disaster strikes when the captain pulls a muscle - and the coach and team are in despair. Who can save them? In the very best tradition of children's fantasy, guess who steps into his boots and leads the famous men in black on to a famous victory? Helen McKinlay lives and works in Christchurch. Her first book was the hugely popular Grandma's Week Off. She is a professional mediator and makes a mean jar of marmalade.